At Copperloy, there are few things we love more than hearing from a prospective client who has a unique and difficult problem with some facet of their logistics or material handling, and then delivering the perfect tailor-made solution with a start to finish custom design and build with our in-house team of engineers. The latest custom material handling equipment home run from our expert engineering team was a heavy duty, 40,000 pound capacity steel pallet. The pallet was for a client in the mining and tunneling industry who needs to haul a great deal of rebar to support their tunneling. A 40,000 lbs steel pallet isn’t something you see everyday and engineering one to safely handle those loads is no small task. For this client, no rebar means no tunnels, and no tunnels means no mining. And when it’s an inefficient, unsafe or costly mechanism to transport those supplies, the entire process slows to a crawl, hurting the business’s output. Increasing the efficiency of transporting their rebar means big increases in productivity and output. Yet, they had never been able to find the right equipment to move the rebar safety with a palletized system that could handle the weight of all of that steel. Our engineers coordinated with theirs, and the result was a robust steel pallet with a massive 40,000 lb. capacity, in both 13-foot and 26-foot sizes to accommodate different environments and needs. We specialize in outside the box designs just like this, and we have with the technology, know how and equipment to pull off successful construction and completion. Close up of the ratchet system for holding the rebar in place on the pallet during transport. Copperloy has the experience and the expertise you can depend upon, and of course, everything we make is proudly produced here in the USA, at our high-tech 70,000 square foot facility in Twinsburg, Ohio. This state of the art facility offers CNC and robotic technology, and our in-house engineering team will see your project through from concept to completion. 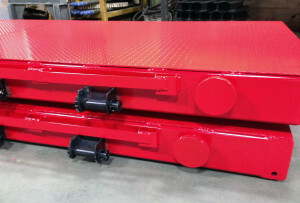 Our custom steel fabrication and custom material handling equipment design services are unparalleled and will offer you the solution you’ve been seeking, and whatever type of unique specification or seemingly impossible challenge you’re dealing with, we’re up to the task. 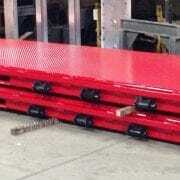 Additionally, we produce a wide range of loading dock and material handling equipment, with an extensive array of specifications including capacities and sizes, such as yard ramps, dock lifts and lift tables, dockboards and railboards, edge of dock levelers, and much more. With the help of Copperloy, this client can quickly and safely haul up to 40,000 lbs. of rebar to their tunnels. What can we help your business do? 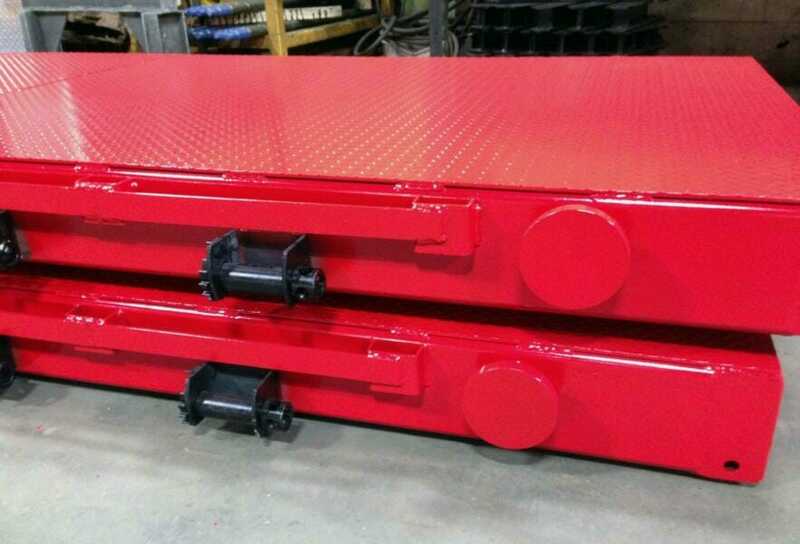 Be sure to check out more great examples of our custom fabrication and material handling equipment on our website. With any questions or to get started with your own custom job, feel free to reach out and call us at 800-321-4968.